The Soul of Sponsorship explores the relationship of Bill Wilson, cofounder of Alcoholics Anonymous, and his spiritual adviser and friend, Father Ed Dowling. Many might consider that such a remarkable individual as Bill Wilson, who was the primary author of AA literature, would be able to deal with many of life's problems on his own. 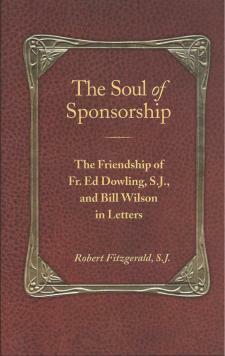 Reading The Soul of Sponsorship will illuminate and answer the question of how Father Ed, an Irish Catholic Jesuit priest who was not an alcoholic, was able to be of such great help to Bill Wilson. Father Ed taught Bill the importance of "discernment." In Father Ed's Jesuit tradition, discernment was a gift, passed down to him from St. Ignatius, the founder of the Jesuits, who described his own struggle with discernment in Spiritual Exercises of St. Ignatius. The Twelve Steps of AA and the Spiritual Exercises of St. Ignatius presuppose that there is a caring God whose will can be known. The act of tuning in to God's action at one's center is discernment. The big question is, how do you know your Higher Power is speaking and revealing Himself through your feelings and desires? What Bill learned from Father Ed can be found in books and articles he wrote for AA. For the good of AA and himself, Bill learned to listen to his desires, be aware of his inner dynamics, and tune into the action of God within. Doing this meant learning to recognize and identify his personal movements -- those inner promptings and attractions often called emotions or affections -- which are part of ordinary human experiences. The person who helped Bill grow in discernment was Father Ed, the Jesuit priest with a cane who limped into the New York AA clubhouse one sleet-filled November night in 1940. The two "fellow travelers," Father Ed Dowling and Bill Wilson, gave each other perhaps the greatest gift friends can give: calling on each to know who he is -- before God.